One thing I dramatically wanted, (and let’s face it, needed) to change in 2019 was how I think about what I buy. Especially when it comes to reducing plastics, but also with my clothes. Now, I’m not actually a huge spender on clothes. I like the odd spree but compared to a lot of people I’m quite tame. However, there’s always room for improvement. Especially when you look at it from an environmental point of view. And was I every really considering what my pair of skinny jeans were doing to the planet? Nope. But I definitely should be thinking more about eco friendly fashion and how I can obtain that. If you haven’t already, go watch Stacey Dooley’s fab documentary on fast fashion on BBC. I won’t go too into detail but in a nutshell the fashion industry has become the second biggest pollutant on our planet. Let me just repeat that. The fashion industry has become the second biggest pollutant on our planet. And we need to be taking more action. I’m not saying I’m going to stop shopping for clothes, that’s not exactly obtainable. However there are lots of little ways I’m considering our planet before I buy clothes, and I thought I’d share them so we can all work towards being more eco friendly with our fashion. Kicking it off with an obvious one, but an oh so easy one. Being in this commodity fetishist world, we all want whats new. The new trends & pieces, especially if you’re in the blogging world. And buying new is just so easy. You just hop online and you’ll get it within a few days. But new isn’t always better. So maybe consider checking what’s on Depop or other marketplace apps first to see what you can find. Usually a lot of stuff is new or near enough new and will knock a few quid off the price if you were to buy it new. I’ve also found Depop is really good for searching specific things. I can search ‘Topshop ribbed jumpsuit’ and I’d say 8/10 I’ll find the exact piece I wanted. If not, I’ll usually find something very similar. Similarly, hit the charity shops. Alas in the UK, charity shopping isn’t as great as thrifting is in the US. And you might not find the exact thing you’re looking for, but you can still find some little gems. And pieces you can upcycle and reinvent. It just takes a bit of digging. Firstly, when I say this. I mean invest into durable, quality pieces that are going to be able to last for ages. Pieces that will handle being washed a lot without fading or deteriorating and can be worn again and again without having much wear and tear. Granted, this can be hard if you’re on a budget, like myself. But a lot of high street shops will provide these sort of things, just do your research and read plenty of reviews before buying. Secondly, create a wardrobe of items that are timeless. I’m not necessarily suggesting creating a capsule wardrobe. But buy basic items that won’t go out of fashion to create the foundations to your wardrobe. Buy items you’ll always want to wear and items that you can make plenty of different outfits from. For me this is things like a white tee, knitwear, black jeans and black ankle boots – basically my everyday uniform which will last in my wardrobe for years. Even if my style changes up, these basics will always be able to be incorporated. Probably the most obvious one, buying from sustainable fashion brands. I’m still trying to find more ethical and sustainable clothing brands, and when I do I will write a whole post with them. But for now, Monsoon and House of Sunny are both well known for being good sustainable brands. Also, check out the ASOS marketplace, as there’s plenty of independent eco friendly clothing shops. And also ASOS themselves are starting to use some recycled materials so watch that space! But I’m also trying to look more closely at what my clothes are made of, and what the alternatives are. There’s plenty of information online (especially Pinterest) which can help you. And again, I’m not going to be able to completely cut out those materials. But every little helps and to keep it budget friendly I’m buying a lot more recycled materials which is just as good. I’m very ruthless when it comes to my wardrobe. Whenever I do a wardrobe clearout I will completely blitz it and get rid of anything I haven’t worn in the past 6 months. And I’m the exact same with buying clothes. When shopping, if I see something I like I need to have a vision of how I will wear it. After looking for second hand options, I also ask myself a few questions: Do I need it? Do I love it? How much will I wear it? If 2/3 are a yes, then I’ll probably buy it. This is a really good way to not go crazy and avoid buying similar items. If you’re renowned for going a bit crazy maybe make a list of bits you need, so you have something to focus on. I am also saying no to excess packaging when shopping. Although you can’t avoid shopping online nowadays, the easiest way to do this is buy not shopping online and actually heading out to the shops. That way you can bring a tote with you and avoid having any plastic bags or unnecessary packaging. I’m definitely no sustainable guru, but eco friendly fashion is something I want to talk on more. And it’s definitely going to take lots of baby steps, as like I said, you can’t just stop shopping. But I can definitely be a little more conscious of what I buy. So hopefully, expect more like this. And with this in mind, I will also be popping a few bits onto my Depop (@emilyybecca) so definitely go check it out! Also a quick final message to say a huge THANK YOU for everyone who voted for me in the UK Blog Awards as I am somehow in the final 8! It’s a little bonkers but I’m extremely grateful. Thank you. Thank you for sharing this, is everyone tried to be just a little bit more eco-conscious the world would be a much better place! Love this post, it’s such an important topic! This is so interesting. Fashion and the environment is something I’ve been thinking about a lot recently and trying to be more eco-friendly. 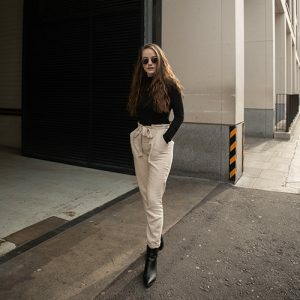 I recently wrote an article about Levi’s and their waterless jeans, so I’d recommend them if you’re looking for a more eco-friendly fashion item. Loved this post em! I just wish this was more noticed within the fashion industry as it can be so harmful for the environment! I’ve always loved charity shops! I too have recently tried to stop shopping online as much and I’m so glad I have done and now read this post! Keep at it em! such an important post, i always shop in charity shops to be a little more conscious of what clothes i’m buying! I couldn’t agree more with you! Although its taken me a while to realise just how polluting the fashion world can be, I’m starting to realise it and i’m beginning to take more active steps in contributing less to my fashion pollution. Great post girl!